If you’re looking for a cheap and good performance electric knife sharpener, the Presto 08800 EverSharp Electric Sharpener is one of the models you shouldn’t miss. You can achieve professional blade sharpening in the comfort of your home with this sharpener. 2-stage electric knife sharpener with sapphirite sharpening wheels (used by professional shops). Click on image to check lowest price and review. 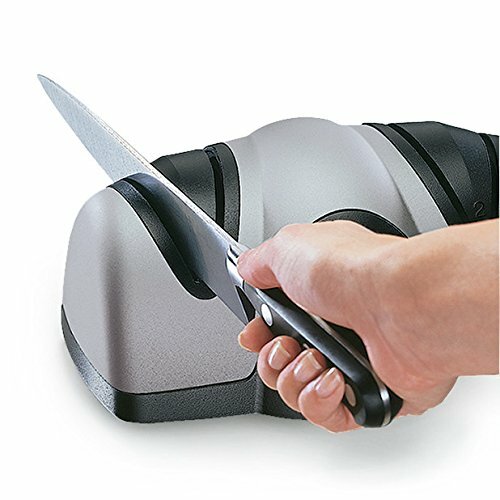 Highly regarded for its budget-friendly and simple operation to restore dull American/European knives, the Presto 08800 electric knife sharpener could be the answer to your problems. The different features entailed below make this electric sharpener a worthy purchase. The Presto 08800 EverSharp Electric Sharpener is quick and easy to use. It features a two-stage sharpening system which can easily sharpen non-serrated blades without going to a professional. The precision blade guides position the knife at the perfect sharpening angle. It creates an edge that is razor-sharp. It uses Sapphirite grinding wheels, which is the same material used by professional shops. The electric sharpener comprises of three suction cups that hold the sharpener in place. Suitable for knives made of alloy, stainless steel or carbon. The product has been made in accordance with the North American electrical standards. The product dimensions are 9.9 x 7.2 x 4.8 inches. Compact and sleek design, blend well with any kitchen. Presto 08800 received more than 3000 reviews on Amazon. Click on image to check lowest price and review. The Presto 08800 EverSharp Electric Sharpener uses a two-stage sharpening system. The sharpening mechanism utilizes the same Sapphirite grinding wheels as used by the professional shops. This allows you to achieve professional quality knife sharpening at home. Start with plugging it in and switch on the power. Always keep the electric sharpener on a flat surface for stability. Clean knives properly using warm water to remove dirt and debris before using it on the sharpener to ensure effective sharpening. After cleaning the knife, run it through the sharpening slot, starting from the heel and slowly moving toward the tip. For a smooth sharpening, hold the blade firmly down to maximize contact but do not apply downward pressure. Let the weight of the knife get in full contact with the grinding wheels. A word of caution, even apply a bit of downward pressure to the knife may cause the motor to stop. Run the knife twice on each side of the blade, which would mean a total of 4 times. In the first stage of the electric sharpener, the knife is ground and sharpened. The sharpening does not take a lot of time because of the solid grinding wheels. But be aware this stage removes more metal so excessive dull knives can be quickly sharpened. In the second stage, the blade will be honed to get a sharp edge. Both stages have 2 slots so make sure the blade is pulled through evenly on both slots of each stage. It requires about only 90 seconds to sharpen a dull blade and even less for just a quick touch-up. The electric sharpener can deliver a sharp edge between 20-28 degrees angle. However, not all types of knives are suitable for this sharpener. Before sharpening the knife, know what blade it is because Japanese style knives with steeper edges are not suitable to use with this unit. Furthermore, it can only sharpen straight edge knives. If you need to include serrated knives, you’d have to look out for other models. Check out this page on best electric knife sharpener to select the right choice out of different brands and models. As a matter of fact, using the Presto electric sharpener is super easy once you nail down this technique. In general, you can easily get professional knife sharpening in the comfort of your home by using this electric knife sharpener. This electric sharpener is a quick and convenient way to sharpen blunt blades. Whether thick or thin knives, it only requires about 2 minutes to sharpen and hone a knife each time. The Presto 08800 uses Sapphirite wheels that are used in professional shops and this is what makes it a good buy. Designed with only a simple operation mode, even a beginner can quickly get a sharp knife without training or skill required. Of course, the more you operate this unit the more you’ll get to know its strengths and weaknesses. It requires very little maintenance, no water or oil-based products are required to clean the unit except clearing the metal filings occasionally. The motor is quiet and the three suction cups on the bottom of the unit do provide stability during operation. But also make sure it is placed on a flat surface before switching on the power. Most importantly, the price is very affordable for everyone. In fact, it’s a steal if you compare the prices with other 2-stage electric knife sharpeners. As this machine sharpens at 20-degree bevel, Japanese style knives will have to put aside. In this case, we’d recommend other 15 degree sharpeners if you have a bunch of Asian style of knives to sharpen. It does not work well for sharpening hunting or fillet knives, too. This unit does not sharpen serrated knives, ceramic knives, and scissors. There are other brands that are catered specially for that. One of the power sharpeners on the market is Work Sharp Knife Sharpener. The Presto 08800 seemed to struggle to deliver the required sharpness for knives with harder steel and thicker blades. Also, when a bit of downward pressure is applied to the knife, the motor can easily stall. It is probably due to the motor not as powerful as other brands – Chef’s Choice knife sharpener. But for its price, it is still a wise investment especially for cooks who never put expensive knives on electric sharpener. The sharpener is your humble servant so always take care of it. Before using the unit, clean the knife preferably with warm water to remove dirt, grease, and debris. Remember to clean the knife with a cloth before using the sharpener. This is the first step to ensure the sharpening process smoother and more effective. With this sharpener, you need not be concerned about the angle you’re running your knife as it comes with precision blade guides that make it easier to sharpen knives at the right angle. Draw the blade slowly and steadily at least twice on each side for optimum sharpening. Be extra careful when grinding because it can do more than necessary. Do not twist the knife as it can easily ruin the blade with ragged edge. Sharpening curved knives is a little tricky. In order to sharpen the tip, slightly pull the knife upwards as it reaches the end to ensure the curved edge is fully in contact with the sharpening wheels. Once you’ve tried a few times, you’ll get the hang of it. Handling thicker blades require a little patience. It requires more passes to grind down the metal to achieve the required sharpness. Regardless of the thickness, it is necessary to hold the blade firmly to maximize contact. But don’t be too firm as too much pressure can cause the motor to stop. Applying more downward pressure to the knife will not speed up the repair process. Remember, the correct technique and patience are the criteria to restore dull knives. This applies to the use of any type of electric knife sharpener. To safely operate the machine, slipper floors should be avoided under all circumstances to avoid any mishaps. Keep the electric sharpener on a flat surface and make full use of the suction cups on the bottom of the sharpener to maintain stability. The Presto 0880 EverSharp Electric Knife sharpener is suitable for not just professional chefs but also home cooks. If you’re looking for an easy and affordable sharpening unit, this one can do the job well. 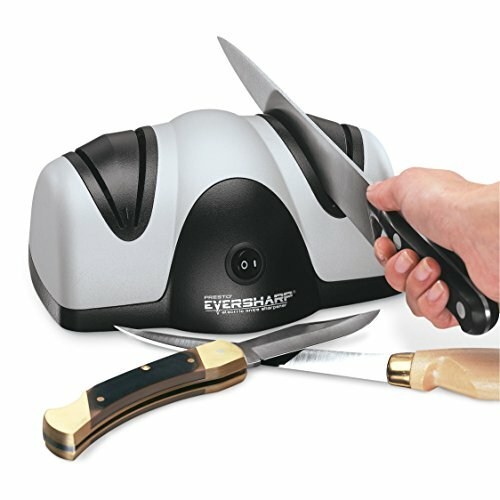 All in all, the Presto 08800 EverSharp Electric Knife Sharpener is highly effective at providing razor-sharp edges. Whether it’s a quick touch-up or a dull blade, the knives will become as good as new while saving you the trip to get them done professionally. The two-step sharpening technique is easy and safe to use. The weight of the electric sharpener makes it convenient enough to keep in the kitchen and only requires a dry cloth to clean it. Make your cooking a fun and easy experience by getting the super-impressive Presto electric knife sharpener.